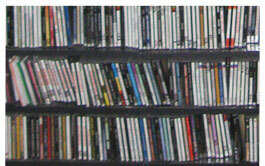 We have several massive CD walls with 100,000+ songs not listed online (including currents and recurrents)! Right click and 'Save Link As' to download a copy of either form listed below to your local hard drive. To view a music list of songs in our format left click on its name below. To download your copy of any list to your local hard drive, right click and pick 'Save Link As'. If you don't want the entire library, pick your songs by marking 'X' in the far left column. You'll only pay for those you do want. Note that Uncompressed Music.com is not the source of any research for these "safe lists". We make no representations of their programming value. They are merely a list of songs played by a large number of stations. Customer makes all programming and music play decisions. You've found the highest quality radio music source. Dave Scott invented SS32 automation while CEO of Scott Studios and invented GoldDisc and HitDisc CDs as CEO of TM Century (now TM Studios). Over the years, his music has been a major source for more than 10,000 radio stations. In 2018, over 1,000 stations ordered music from us. *Music only sold to radio stations with valid music performance licenses.